How about a WCHA and NCHC Challenge? Things never stay the same, they evolve over time. Sometimes change isn’t always for the better. For the most part, human beings are resistant to change because they’re afraid of the unknown. With the conference realignment, some issues have emerged. After two years of watching their conference tourneys, National Collegiate Hockey Conference and Western Collegiate Hockey Association fans have come to the conclusion that things could be a lot better and reminisce about the old days. Prior to realignment, the WCHA averaged 16, 075 fans per session over a five-year period. Post realignment, the WCHA has averaged 5,622 fans per session over a two-year period. Obviously, the teams in the WCHA have changed drastically, but that’s a huge difference in attendance numbers. The Big Ten Hockey Conference has struggled at the turnstiles, too. Over the same two-year period, the BTHC has averaged 6951 fans per session. For comparison sake, over the same two-year period, Hockey East has averaged 12,452 fans per session. This past March, one of the ideas that was bounced around was the idea of holding the NCHC and the WCHA tournaments in the same building, on the same weekend. On its face, it sounds like a great idea. You could start the WCHA tourney on a Wednesday or Thursday and have both conference tourneys playing on the same weekend in the same building. Preferably, the Xcel Energy Center. Half empty buildings aside, the NCHC and WCHA commissioners will not be combining the conference tourneys in the same venue. According to Matt Wellens of the Duluth News Tribune, the subject was discussed briefly, but the NCHC and WCHA commissioners, are going to keep things the way they are. Matt Wellens, Duluth News Tribune — In interviews last week with the News Tribune, both commissioners downplayed the idea of the events sharing the same sheet of ice on the same weekend, with Fenton saying he didn’t remember discussing that specific topic with Robertson. Robertson said he brought up the idea of “a way for these tournaments to work closer together,” as part of a casual conversation over lunch. It wasn’t a deep discussion and no details were discussed, Robertson said. It was one of many ideas tossed around during lunch, like a possible NCHC-WCHA challenge, Robertson said. I am relieved that the NCHC and the WCHA aren’t going to combine their conference tourney in the same venue, at least for the time being. I think this would’ve been an irrational, ill-advised solution. Let’s not forget that the NCHC also had three more years left on a contract with the Target Center. How about a WCHA-NCHC Challenge? Ironically, since the NCHC formed I have always thought that an NCHC-WCHA challenge would be a good idea. Under the former WCHA commissioner Bruce McLeod, this wasn’t going to happen. There were probably too many hard feelings to make this happen. That being said, having an NCHC-WCHA challenge would be a great idea. This could also become a potential money stream for both conferences. Think of the possibilities. You could have tourney like the Great Lakes Invitational have a number of teams (4-8) rotate in an out of the tourney. Or you could have a challenge like the ACC/Big Ten Challenge and involves all of the teams in both leagues. 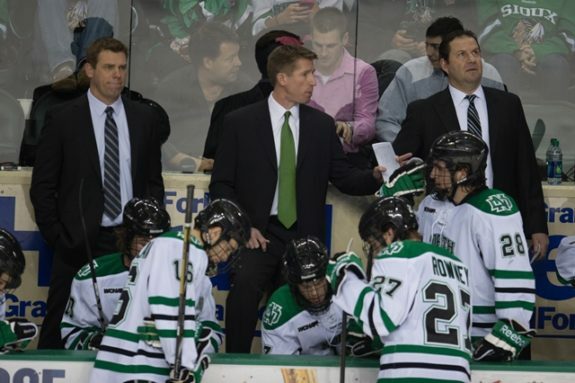 The WCHA has a 28-game schedule so that could be one potential stumbling block. The WCHA has a limited number of non-conference games. Finally, I think that fans of both conferences need to be patient and let their respective conferences develop rivalries and a history. Rivalries aren’t born overnight, they develop over time.